The in-your-face frontal profile of the W990 is impossible to mistake for anything but a Kenworth. Change isn’t always easy. Kenworth’s W900L has been around in its current trim since before the turn of the century, so it’s had plenty of time to establish itself as iconic. Early reactions to the new W990 on social media indicate some resistance to changing such an icon. But everything on wheels evolves. The W990 is a product of its time, and its styling is more contemporary than that of the W900L. Just compare any of today’s half-ton pickup trucks with those that were around during the Y2K scare. Kenworth General Manager Mike Dozier said during his opening remarks at the W990 launch that the evening was about celebrating the legacy of the W900 and the introduction of the next generation of the W900, the W990. The dash and amenities are the same as we find in the T680 and T880, highlighted by blue accent stitching in the steering wheel wrap and the VIT interior trim. 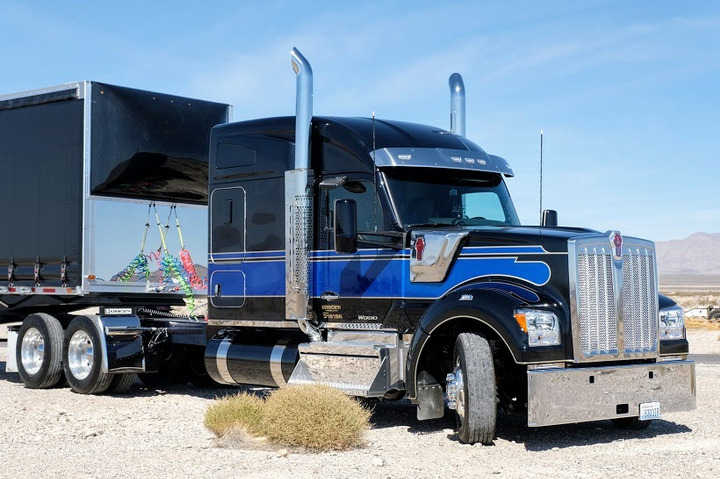 The W990 uses the same cab and sleeper package currently offered on the T680 and T880 on-highway models. 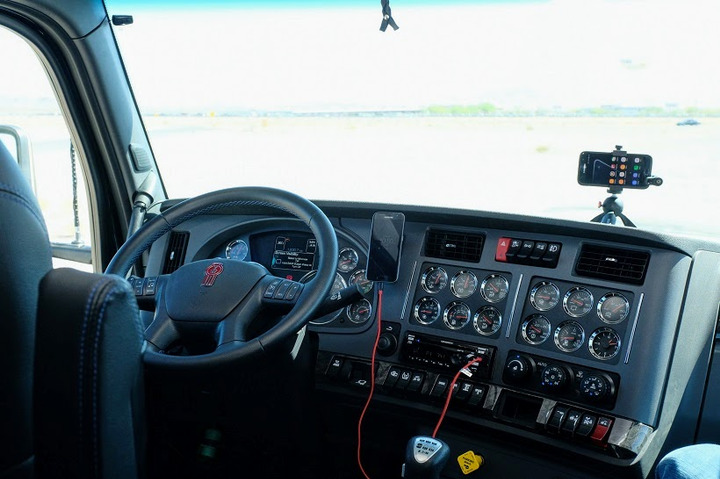 It’s the much-touted 2.1-meter cab that Kenworth debuted in 2012. The dash layout is the same, as are the available instrument and navigation packages. Out back, three sleeper options are available: the 76-inch mid-roof, a 52-inch mid-roof, and a 40-inch flat-top model. Obviously, a new hood was needed to mate with the wider cab. The hood is 1.5 inches longer than the W900L hood, giving the truck a bumper-to-back-of-cab dimension of 131.5 inches. The grille looks enormous and is designed entirely of polished stainless steel with the traditional cast aluminum hood pull. Behind the grille is the largest cooling module Kenworth puts in an on-highway truck. The headlights have the same optics as the T880. The fenders are replaceable and can be ordered with the flares to accommodate larger steer tires on heavy haul units. And perhaps most conspicuously, the air cleaners are gone. They have been replaced by a single under-hood air filter and a pair of stainless-steel intake ports on the sides of the hood. And there are two bonus features with the W990: On some models the steering cut can be up to six degrees tighter than the W900L, and the whole truck is said to be 6-7% more aerodynamic than its near-namesake. Kenworth provided a choice of four trucks for editors to drive on the morning following the launch. They were essentially the same except for the powertrain. Two came with a Paccar MX-13 engine and the Paccar Automated Transmission, while the others featured a Cummins X15 with an Eaton 18-speed manual gear box. I drove one of each, so this review is a mashup of two trucks. 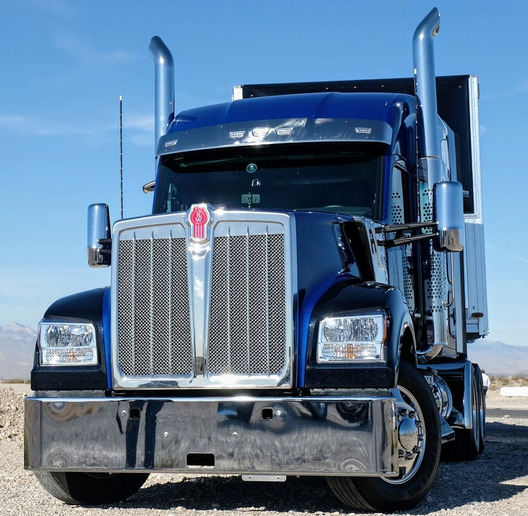 With a roomier cab, a bigger hood, lots of real stainless steel and aluminum trim along with very contemporary styling, the W990 is a capable contender for the top spot in the Kenworth stable. I don’t think the big new hood compromises visibility at all. It’s wider at the cab, but without the old air cleaners, I’d say it’s a wash. Straight out front, while it’s a bit longer, the hood’s extra width seems to even things out optically. It doesn’t look longer, but it certainly occupies more of the driver’s field of view. One of the trucks had a 300-inch wheelbase, which required slightly wider turns. I had no difficulty swinging through a couple of street corners near the dealership where we picked up the trucks, nor making a 180-degree turn in the dealer’s back lot. I really liked the steering, partly the result of the set-forward steer axle and partly Kenworth’s trademark slightly firm steering feel. The truck kept a perfectly straight track out on I-15 near Las Vegas. I checked the noise level in the cab with an iPhone sound meter app and found the truck with the X15 had a reading of 68.6 dB, while the MX-13-equipped truck racked up a slightly quieter 67.3 dB. I also got a reading of 63 dB on one try (the app takes a 10-second reading and provides an average) but I think the truck was just coasting at that point. By comparison, my VW Jetta has an interior noise level of 63 dB. The W990 is a quiet truck indeed. It wouldn’t be fair, after a couple of hours of driving, to judge the W990 against the W900L’s 18 years in the market, but I have to say it showed very well. If the truck had any other badge on it, I think early approval numbers would be off the chart. The new kid in town will have to elbow his way up to the bar and jostle a bit to find his place, but I’m confident the W990 will earn a spot on the order boards. It’s a great truck, even if its modern looks don’t yet appeal to some more conservative truck buyers.